Negotino ... Following the course of the international highway E-75, 41 km from Veles, and 64 km from Gevgelija in the central part of Republic of Macedonia, is the town of Negotino (on Vardar). Negotino is settled in the Tikves region, well known for it's production of wines and rakija (Macedonian brandy). Negotino is the seat of the Negotino municipality, with 18,341 inhabitants. 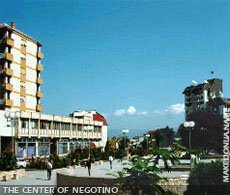 Negotino is located 94 km far away km from Skopje, while from the nearest city of Kavadarci is just 10 km away. Negotino can be entered by a car or bus, but also by a train. Negotino name appears for the first time as a name of a Turkish ciflik (manor) at the beginning of the 19th century. At this time, by the Tair-aga Sinan, the Clock Tower was built, which is one of the famous monuments of the town is the Clock Tower, which suffered the great fire in 1913. The Clock tower is today a landmark of Negotino of wine-cellars. In the ancient period, (3rd century B.C.) on the territory of the present-day Negotino, the settlement Antigona was built - the town of the ruler Antigonius Gonat.